The Mt. 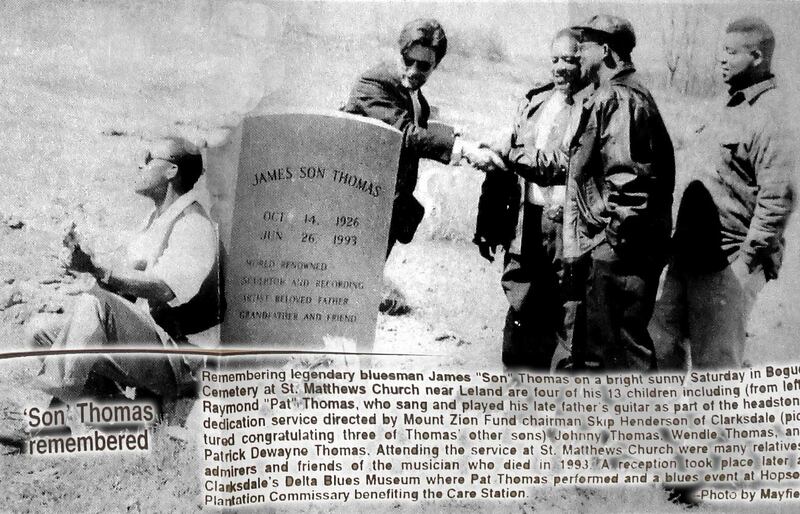 Zion Memorial Fund placed a large memorial headstone on the grave of James ‘Son’ Thomas on March 9, 1996 at St. Matthews Church in Leland, Mississippi. 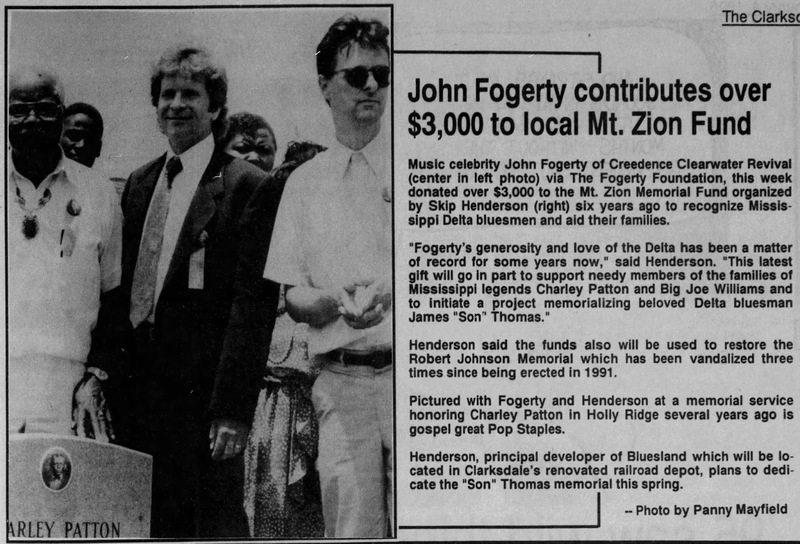 John Fogerty financed the stone. 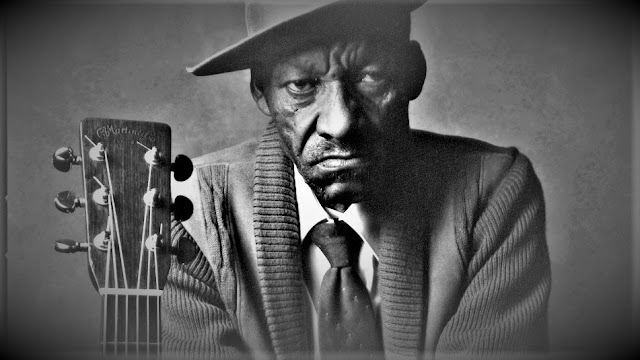 The unveiling was followed by a ceremony attended by Thomas’ large extended family and numerous local friends and musicians including Texas guitarist Rick ‘Casper’ Rawls and several other noted musicians from Austin and Memphis. 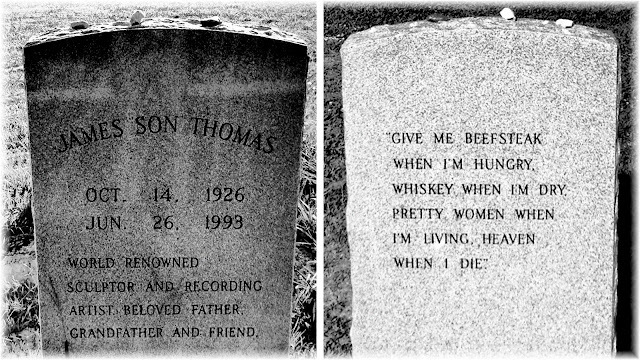 Thomas, a grave digger by occupation, who remained a beloved fixture in his home town of Leland, was also a renowned folk artist, sculpting figures in deathly repose as well as expressive skulls. His work has been displayed in the Corcoran Gallery in Washington D.C. (where he met and charmed then first lady Nancy Reagan) as well as in galleries in New Orleans and Memphis. He is remembered for his musings on the subject of death, often spoken at concerts and reflected in his lyrics which appear on his headstone. 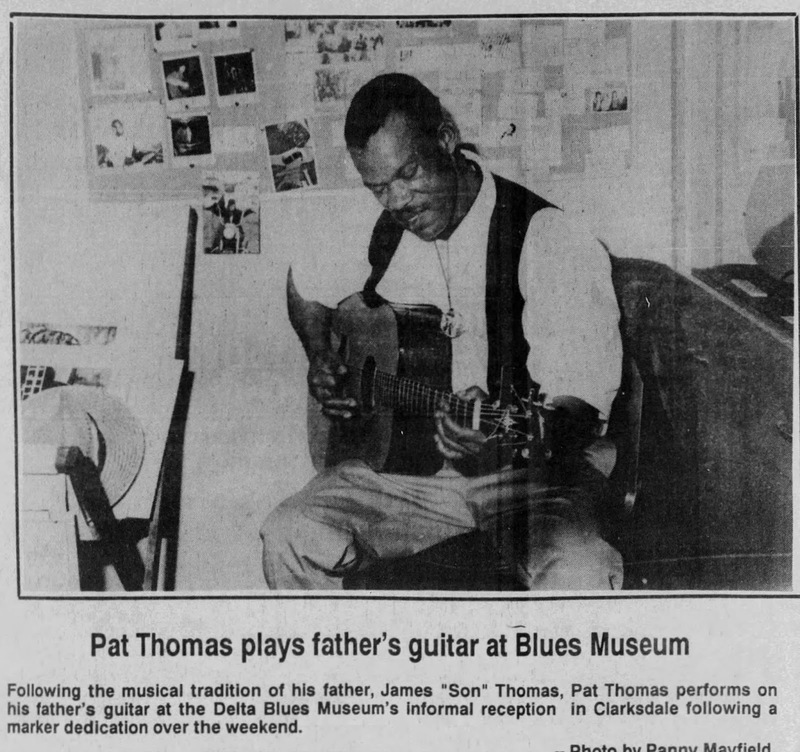 In one article for the (Clarksdale, MS) Press Register, a photograph from Panny Mayfield shows four of Thomas' 13 children including (from left) Raymond “Pat” Thomas, who sang and played his late father’s guitar as part of the headstone dedication service directed by Mt. 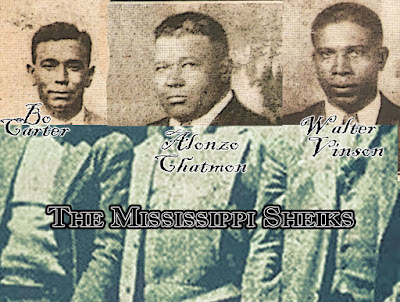 Zion Memorial Fund founder Skip Henderson (pictured in upper right congratulating three of Thomas’ other sons) Johnny Thomas, Wendle Thomas, and Patrick DeWayne Thomas. 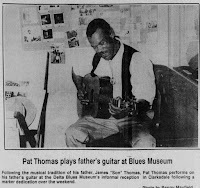 Sid Graves, founder of the Delta Blues Museum, hosted a reception following the dedication, which featured a performance by Raymond "Pat" Thomas. 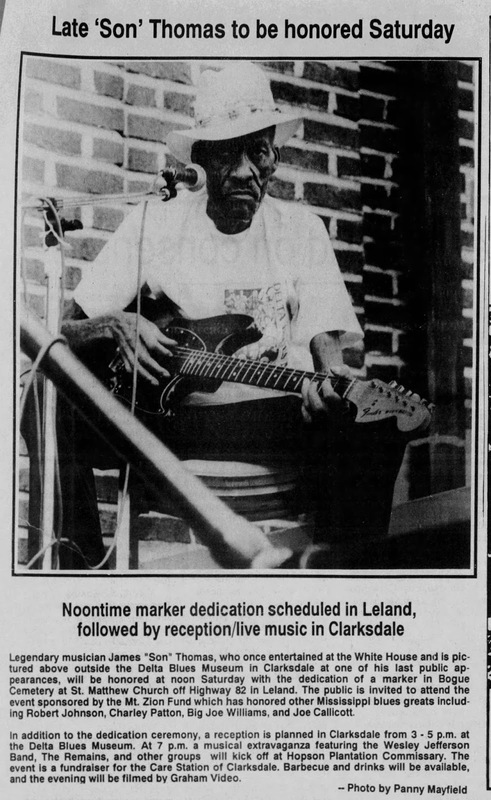 The owners of Hopson Plantation Commissary also hosted a blues event in honor of "Son" that benefitted the Clarksdale Care Station, a non-profit founded in 1987 "to feed the sick and shut-in" by "providing meals to needy persons" and by feeding "their souls with God's word delivered daily by local pastors." 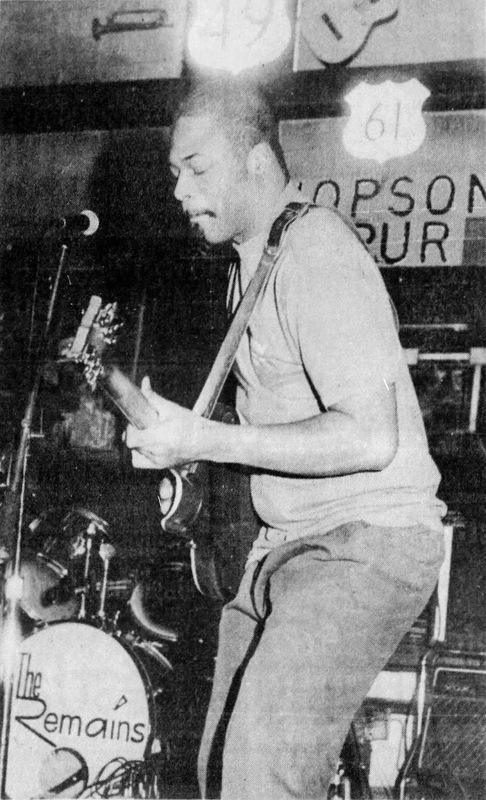 Both the opening act—The Remains headed by Ronnie Drew—and the multi-talents of virtuoso guitarist Terry Williams (center) contributed to the success of the music benefit at Hopson that raised an estimated $400 for the Care Station. 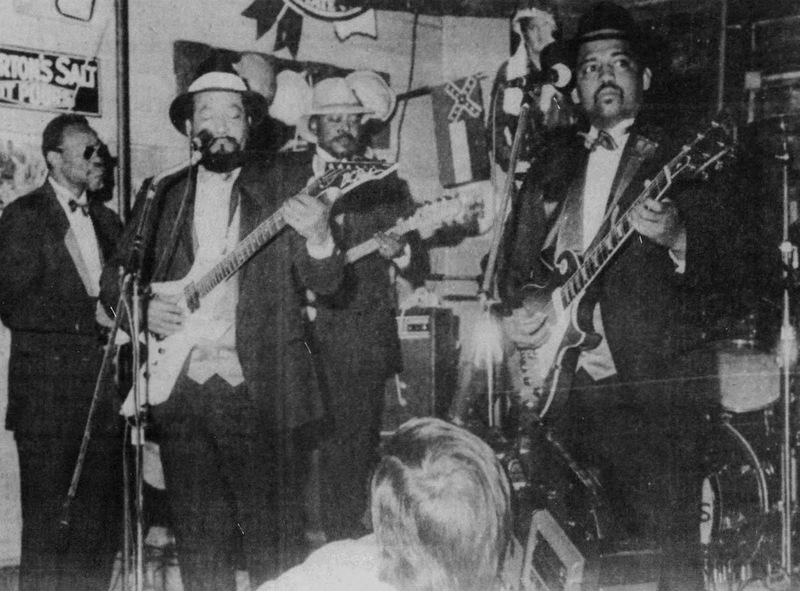 Featuring the "sharp dressed men" of the Wesley Jefferson Band (right) in black tuxedos and red vests including (from left in photo below) Wesley Jefferson, James "Super Chikan" Johnson, Rip Butler, and Michael James, the benefit was filmed by Graham Video.